Neither Amy or I have had much experience with slings until now. We've been intrigued by them since Stephanie the Babywearer came into our blogging lives. I never really "got" slings, but since I've been reading up on them, I've really wanted to try one out. Well, we got the chance, thanks to Rockin' Baby Shop! Not only did we get the chance to try out slings, but we got some of the COOLEST ones on the market! 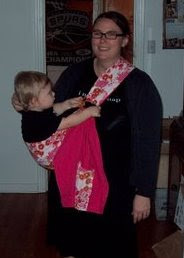 The sling pictured here with Noel and I is the Strawberry Fields Forever Ring Sling. This sling absolutely exudes my personality! It's a cool 60s flower pattern and it just rocks. I love how comfortable it is too! Amy received the Ziggy Stardust Pouch(fellow Bowie fans! ), that she will review soon-along with a contest for a Rockin' Baby Car Seat Cover! I had no idea that slings could be the answer to all of our traveling outside the house issues. Now, my son is very well behaved, but we can not make it to more than 2 places while running errands before he wants to run around or be held. The first time we went out with the sling, I was able to take him to three different places with nary a fuss! I was amazed. He never tried to get out, never wanted down, and never whined. It was also lovely to carry him without him getting heavy without my back hurting. In a word, my sling is incredible! I never go anywhere without it now! I'm also excited to try the sling out with my new baby, due February! I plan on wearing this one from day one! 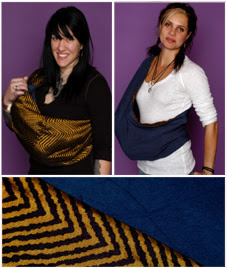 Rockin' Baby Slings are all named after songs or rockstars-a company after my own heart! They also have cool clothes for your rockin' girl or boy and lots of rockin' goodies! Each month, the ladies of Rockin' Baby Shop donate 3% of their proceeds to their favorite charities. Lisa and Natasha, the owners and geniuses behind the slings, are doing good deeds and helping moms and dads be close to their little ones! All right, ladies! If you're in the market for an outfit that will make your kid the star of the sandbox, or looking for a sling that's gorgeous, durable, and well...rockin', you need not look any further than Rockin' Baby Shop!